Two descendants of a 19th Century explorer from Cornwall are to join an expedition to retrace his historic journey down an African river. In 1830, brothers Richard and John Lander discovered that the River Niger in West Africa terminates in the sea. To mark the 200th anniversary of Richard's birth, a 12-strong team will paddle a canoe down the Niger. Among those taking part in the trip are John Lander's great-great-great-granddaughters Megan and Emily Lander. The trip, taking place in November and organised by the Police Expedition Society, will follow the brothers' 430-mile route down the river. It will start in New Bussa, Nigeria, and end at the new Lander Brothers Anchorage and Museum at Asaba. It is also to be filmed for a documentary. The paddlers will stop at places mentioned in the Landers' journals - including the village where Richard was accused of being a British spy and forced to drink poison. 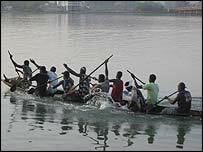 They will also call at the village of Kirree, where the brothers were attacked by 40 war canoes and held to ransom. Another team member is Simon Hendra, a pharmacist from Richard Lander's home town of Truro in Cornwall. He said: "It is a difficult climate, but apart from that it shouldn't be too bad. There are lots of civic receptions en route." Dave Martin, boat building manager at Cornwall's Falmouth Marine School, has designed the 25ft-long expedition boat to look like a traditional African dug-out canoe. Richard Lander, who is honoured with a 15m monument in Truro, was the first person to be awarded the Royal Geographical Society's Gold Medal. He died in 1834 at the age of 30 when he was ambushed and shot by tribesmen while leading a trade expedition up the River Niger.